We made it onto the front page of West Hawaii Today (Sunday edition) - great article recapping the Wildfire Preparedness Day event we held at the Waikoloa Dryland Wildfire Safety Park. The article also covers some of the wildfire issues communities in Hawaii face and some of the steps people can take to protect their homes and families. 'Waikoloa Village resident Melissa Newberg vividly remembers the Lalamilo fire of 2005. Eight months pregnant, she and her family scrambled to pack up photo albums and important papers. As a fire that would ultimately consume 25,000 acres burned fiercely outside the village and helicopters buzzed overhead, the Newbergs evacuated to a friend’s house in Kailua-Kona. The Newberg home was spared — albeit with a thick layer of ash left on the lanai. Nine years later, Newberg and her 3-year-old son, Xavier, sat in the Waikoloa Dryland Wildfire Safety Park. While her daughters, Kamila and Alena, placed native plants in the cinder soil nearby, Newberg cleaned up dead leaves. It is the type of activity the Hawaii Wildfire Management Organization is encouraging everyone to do as the island heads into summer. It is also a cue the western mainland states would do well to follow, as drought and high fuel loads spark wildfire fears on the national level. The Melia Street wildfire safety park was part of a larger demonstration by the Hawaii Wildfire Management Organization that landscaping with native plants can reduce fire risks around the home. It was a centerpiece of a wildfire awareness event Saturday that also featured informational booths, art projects, presentations and tours of fire engines and emergency vehicles. Piper Heath, 11, and Sai Cordeiro, 12, were part of a group of youngsters planting seedlings at the park Saturday. 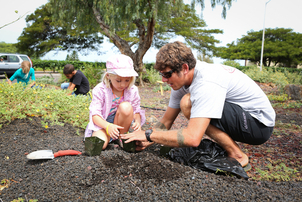 They are both members of Waikoloa Future Foresters, a group created three years ago by the Waikoloa Dry Forest Initiative to bring area children in contact with reforestation, fire prevention and other aspects of conservation. Part of their task is to understand the park, help take care of its plants and give tours to the public. Heath and Cordeiro happened to be planting Cordeiro’s favorite plant, the ihi, a native succulent. The park, with plantings of ilima papa, wiliwili and a ground cover called pohinahina, is meant to demonstrate that fire-resistant native plants can be low maintenance, said Pablo Beimler, education and outreach coordinator for Hawaii Wildfire Management Organization. “These plants are already adapted to the ecosystem and the minerals in the soil,” Beimler said. They represent a less colorful but wiser choice from a fire safety perspective than the flamboyant bougainvillea, which tends to leave a lot of flammable debris. Beimler said that picking up woody debris from the yard is one of the best ways residents can help prevent fires. Residents should also put fine screens over their vents — especially at the foundation level — as a key step to keep burning embers from blowing in, Beimler said. Other measures include keeping a “defensible space,” of area cleared of dead vegetation in a 30-foot perimeter around the home — plus making sure grass, trees and other vegetation are trimmed. A general awareness of the conditions on the surrounding landscape, and a family action plan in time of fire are also important, Beimler said. The problem of fire isn’t limited just to ruined forests and homes, said Elizabeth Pickett, Hawaii Wildfire Management Organization’s executive director. Erosion from the exposed land washes downhill and can smother reefs, bringing environmental consequences into the ocean.